By LUDWIG VON KOOPA - Booyah! is a sociopositive signal of mindfulness. Not doing it is sociopathic. 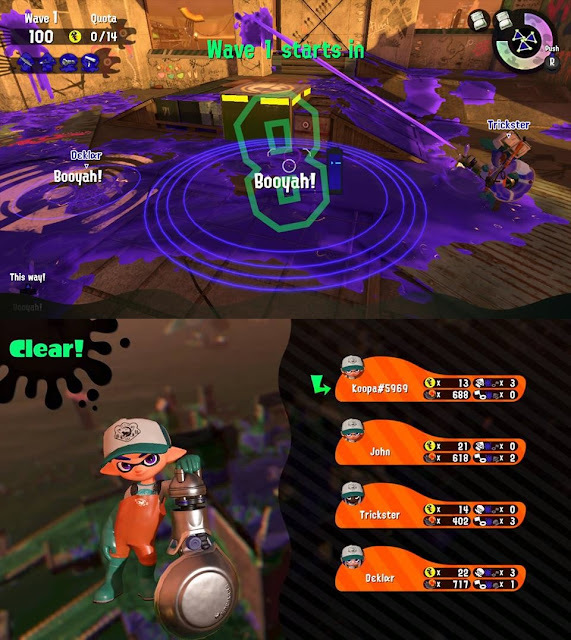 Studies show that starting a Splatoon 2 match or Salmon Run shift with a Booyah!, and then having your teammates Booyah! back, improves team cohesion and performance. On average, non-Booyah! participants perform worse in team-based settings. Why is the Booyah! button so powerful, and what is its significance in Splatoon 2 play? I'll explore that in detail in this article. 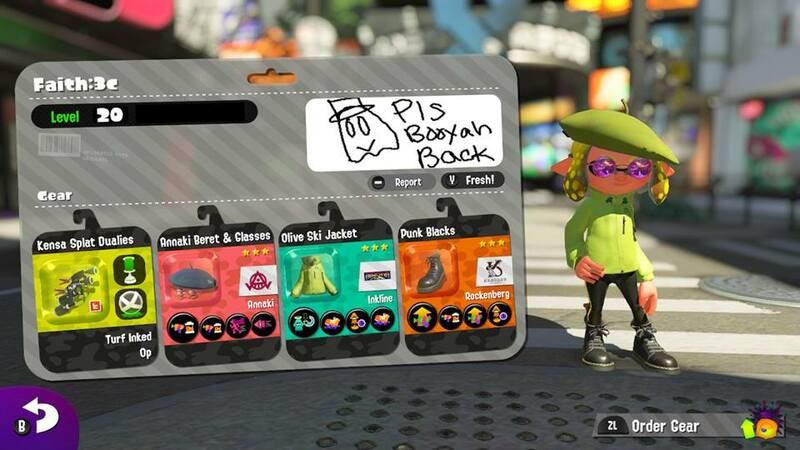 “Pls Booyah Back” says Faith:3c. Much like Shalom in Hebrew, Aloha in Hawaiian, and Alola in the Alola region, the phrase Booyah! has many meanings that go deep into the culture that holds Inkling and Octoling societies together. It's more than just the name of a shopping mall complex in Inkopolis Plaza. “If they don't BOOYAH! at the start of a round, don't trust them. And it's true. Right after seeing Faith:3c's Inkopolis Square post, I did Salmon Run shifts. I always started every wave with a Booyah! I kept track of who yelled it back and who stayed quiet. The Inklings (and some Octolings) who returned my Booyah! died less often and saved more people... usually saving the people who didn't yell Booyah!. Sometimes those people don't even yell for Help! No Booyah! is a big red flag that I need to be concerned about, because if a teammate won't Booyah! back and acknowledge my attempt at communicating with them in a no-threat tranquil environment, will they have my back when there are masses of Salmonids or enemy Octolings approaching my position? At the start of this shift, I said Booyah! and that funnily-written Deklar guy said Booyah! back. Guess who did the best? Me and Deklar. Booyah!-less Trickster and John just died a bunch. Mindfulness allows us to find and rescue people who get splatted, despite their lack of Help!. It gives us the knowledge that shouting THIS WAY! from the middle of the map, even though we're heading in the east direction, doesn't give our teammates the knowledge that they should also be heading east — since THIS WAY! only tells you your current location, not your direction or eventual destination. It provides knowledge that shouting THIS WAY! from the corner of the map because you just killed a Goldie that exploded into ten Golden Eggs — and standing there for a long time continually shouting THIS WAY! — isn't a great team move. It also means that you might not make collecting eggs the top-most priority. You might let your teammates get the eggs if it means that you'll be keeping the map clear of threats and nuisances—especially if your weapon supports that role. But maybe you're in the event with the cannons on the shore, and you see your teammates aren't collecting enough eggs for some reason while you're shooting away at the cannon. You'll be mindful to get off of it and help achieve the objective. There are many uses for mindfulness in Ranked matches or Turf War, a lot of which can be observed by just checking your map, discussed in this article about how the most recent Splatfest was unfair due to the ink colours. Communication is key for helping remind people what's going on. Since Booyah! can mean so many things, you need to be aware of the context that each teammate is in. You need to constantly be in-tune with them. Booyah! encourages this mindset. It's rather telling, and demonstrative of how central it is to civilisation, that after being splatted, THIS WAY! turns into HELP! or OUCH! but Booyah! will always remain Booyah! regardless of the circumstance. Booyah! is always there. Booyah! is in both Splatoon and Splatoon 2, unlike the ill-fated C'mon!. 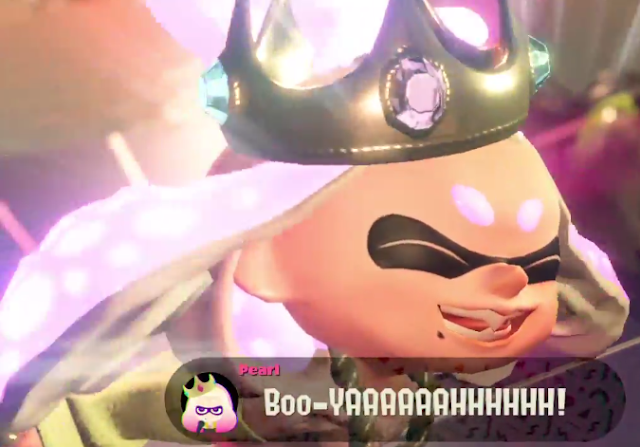 There's nothing stopping you from saying Booyah! back. Pearl, the best Off the Hook idol, screaming Booyah! If she does, you should too. It's a special article for Sunday! No article for Monday, though. This article exists for one of KoopaTV's background patrons who has donated to the site before. It's her birthday today, and she wanted something written for today and about Splatoon, so this exists. She also happens to say Booyah! back, so it's a request worth doing. It should be made law in Inkopolosis that if one of your teammates Booyahs! then you must Booyah! back or else look less fresh in the eyes of society. If there was a Splatfest dedicated to this issue, those in favor of this bill would definitely win the popularity vote. While anything could happen in the matches, I believe that we would still prevail in the end and settle this debate once and for all. Team Booyah! would obviously win the matches because Booyah! helps you do better. That said, I don't like unnecessary laws. You can ostracise people without it being a law. But Inkopolis ain't my society. Squidwig's, not mine. When I was at the Monterey bay Aquarium, we were feeding squids to bat rays and someone in the background said, "Booyah." I wonder if it was a coincidence or a reference. Or was it the squids themselves? Would the squids yell "booyah" as they allow themselves to be fed to bat rays, knowing they are part of the great circle of life and they all accepted their fate? They say it for everything else, so...yes.